Have you ever felt overwhelmed while purchasing the right sunscreen for yourself? Especially when the market is flooded by products with so many acronyms and numbers? Well, picking a sun protecting cream or lotion with the right ‘SPF’ is a real tough task. If you believe that a higher SPF number is always better in case of sunscreen, think twice as we are going to ‘decode’ all those ‘SPF secrets’ in this article. Read on to know more and discover what SPF you should actually be wearing. What Do the SPF Numbers Actually Mean? SPF refers to ‘Sun Protection Factor’, which is basically a measure of the capability of the sunscreen to avert severe damages caused to our skin by the harmful UVB (ultraviolet B) rays of the sun. To be more precise, SPF is a certain standard that is used to determine the time period for which we can stay outside in the sun without causing significant burns to our skin. It is expressed by a number, which indicates the total time you can spend in the sunlight without reapplying the product. For example, if your skin can tolerate UVB up to 10 minutes and the label of your sunscreen shows ‘SPF 15’, it means you can spend around 150 minutes in the sun by wearing it without getting your skin burnt. What is the Best SPF for Daily Use? Now the question is, what SPF should you be wearing for your day-to-day activities? 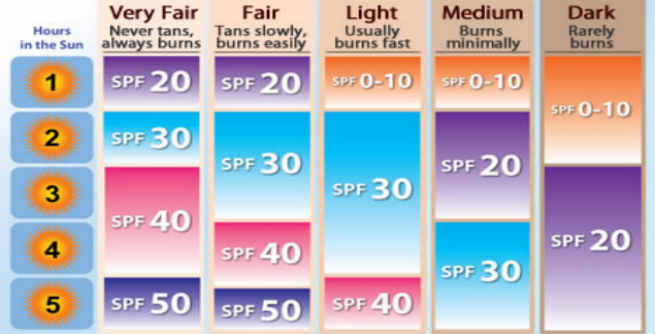 If the maximum time required by you to stay outside is anywhere between 30 minutes to 1 hour, a simple SPF 15 will do. But, in case you need prolonged exposure to the sun, it is recommended that you opt for an SPF 30 or more. According to experts, a sunscreen featuring SPF 30 as well as broad spectrum (both UVA and UVB) protection is the best choice for anyone, who needs to stay outside every day for a considerable time span. However, if you are going to participate in any kind of outdoor activities, choosing an SPF 50 is necessary. Many of us combine two low level SPFs or layer one over another in order to make the sunscreen application more effective. Well, let me tell you that you are doing it wrong. There is no scientific evidence that layering SPF 15 over SPF 10 gives as strong protection as a single SPF of high level (as i.e. SPF 25) provides. The practice does not at all increase the potency of the sunscreen. Does the Choice of SPF Depend on Skin Tones? The answer is ‘no’. Your choice of SPF numbers should never be linked to your skin tone. Wearing sunscreen means protecting your skin from the damaging UV rays of the sun, preventing premature aging and keeping fatal diseases like skin cancer at bay. Hence, everyone should use it. However, make sure that you keep your complexion in mind while buying the right SPF for yourself as it will help you figure out how fast your skin can get burned in the sun and decide on what SPF you should be wearing in order to protect your skin from that.